Excessive and yearly wear is an important to know as much as you can. Yearly wear is a problem. It is typically caused by improper floor maintenance that fails to remove grit from the floor, or the introduction of water or strong cleaners. Pet nails and unprotected furniture legs also contribute to the problem. Proper maintenance requires regular dust-mopping with an approved wood floor cleaner. 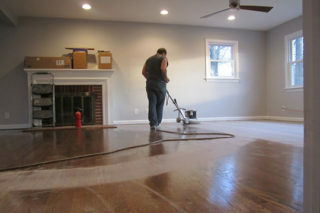 If re-coating is necessary then you might want to consult a professional floor company. Floor discoloration can occur. Oil modified finishes will amber in appearance and will yellow further over time. Wood in direct sunlight will change in color and lighten over time. Re-coating an oil-modified finish re-coated with water-based finish will not stop ambering. Shading the floor can minimize lightening. Wood also changes color through oxidation. Stains can also be a problem. Spilled water, pet stains and other liquids, including improper cleaners, can stain finish. Cloudy surface finish can be fixed by lightly rubbing with a proper cleaner and buffing, although some stains require screening and re-coating. During a refinishing process, some boards may need to be replaced. Floor roughness is a problem sometimes when troubleshooting finishes. The cause is often contamination of the finish during its drying time, as well as by failure to screen or abrade between coats of water-borne finish. Moisture can also cause wood grain to rise. If a moisture problem is evident, this must be corrected before screening and re-coating. Sometimes a complete re-sanding job is necessary. Sometimes there are uneven gloss levels after refinishing the floor. This would be due to insufficient mixing of the finish prior to the application. In this case, also, a contaminated finish applicator and un-even sanding or finish thickness can be culprits. All of these situations can require screening and re-coating. Sometimes you can see peeling and bubbles. 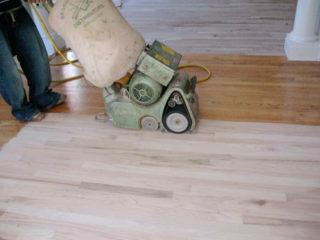 Bubbles and blisters in the finish, usually mean that the floor was not screened or sufficiently cleaned between coats of finish, or the finish was over worked during the application, or the soap or some other contaminate was not properly removed before coating the floor. It can also be caused by the floor drying too fast as a result of hot spots from sunlight. Problems in the top most finish coat can be screened and re-coated, while cases of delamination require complete sanding and refinishing.